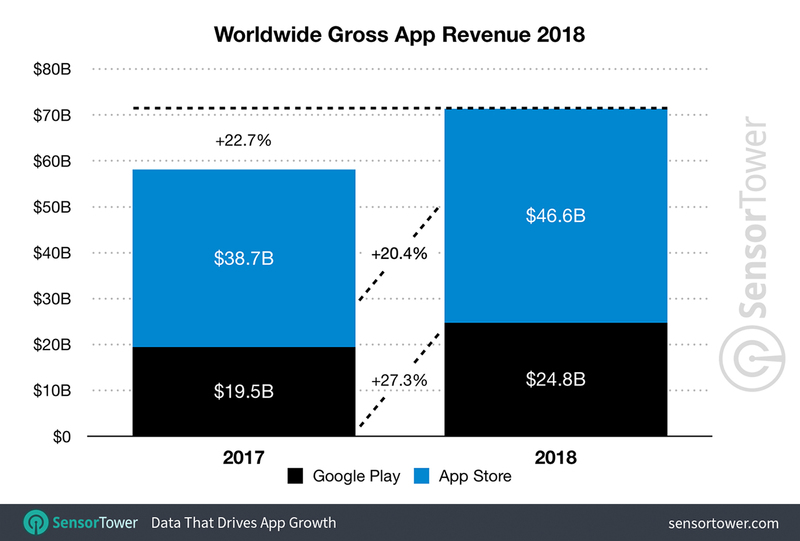 App analytics firm Sensor Tower has published its 2018 revenue estimations for the App Store and Google Play Store. Both app stores saw growth, but surprisingly Google Play grew at a faster rate. However, the App Store still makes more money. 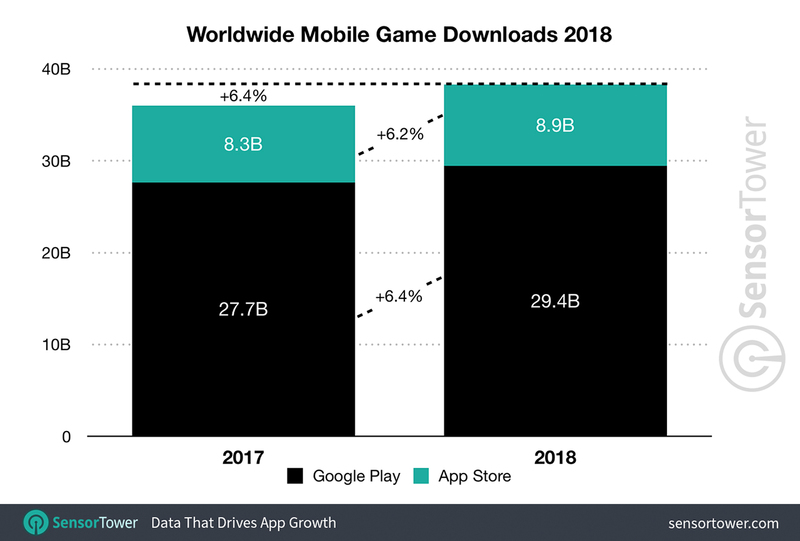 Worldwide, users spent $71.3 billion USD (roughly $94.6 billion CAD) on apps and games in 2018, according to Sensor Tower’s estimates. Overall, it marks a 22.7 percent increase over 2017. The firm estimates the App Store generated $46.6 billion USD (approximately $61.8 billion CAD) in revenue in 2018 compared to the Play Store’s $24.8 billion USD (about $32.9 billion CAD). That’s a difference of about 88 percent. Further, these numbers mark a year-over-year growth of 20.4 percent for Apple and 27.3 percent for Google Play. However, Sensor Tower points out that if you look at past years, the App Store is on the rise after a significant decline. In 2016-17, the App Store saw 34.7 percent growth but declined between 2017 and 2018. Sensor Tower attributes this to a slowdown in Chinese consumer spending. Google Play Store estimates don’t include Android revenue from China as the store isn’t available there. 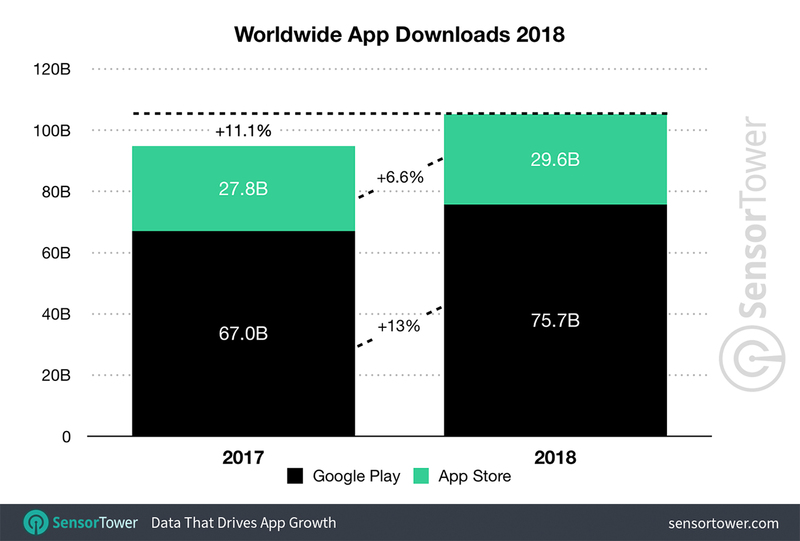 Additionally, first-time app installs grew by 11.1 percent for both stores, exceeding 105.3 billion total in 2018. Apple saw 6.6 percent growth from 27.8 billion first-time installs in 2017 to 29.6 billion in 2018. The Play Store had a 13 percent growth in 2018, up from 67 billion to 75.7 billion first-time installs. Gaming also continues to grow, with a 15.2 percent year-over-year increase to $54.7 billion USD (about $72.5 billion CAD). 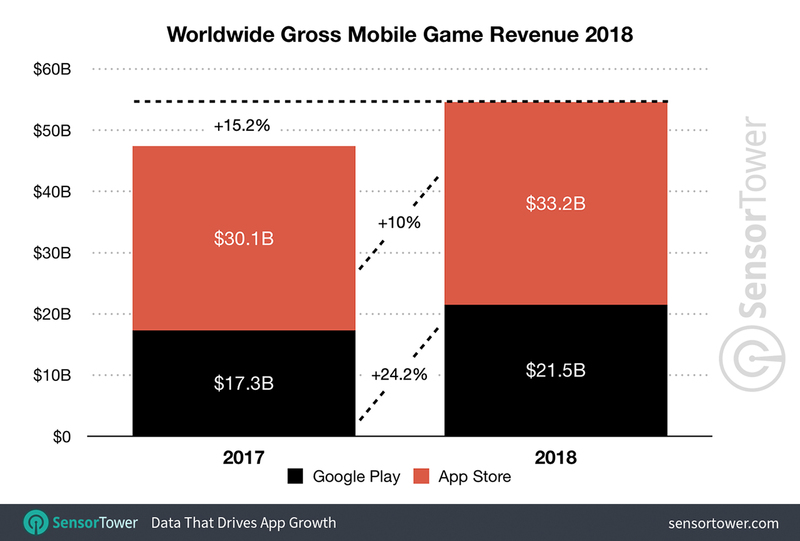 Despite the growth in revenue, gaming’s share of all app revenue fell from 82 percent in 2017 to 77 percent in 2018, signalling that non-gaming apps are starting to monetize better. Apple’s App Store grew 10 percent in estimated gaming revenue, from $30.1 billion USD to $33.2 billion USD (roughly $39.9 billion to $44 billion CAD). 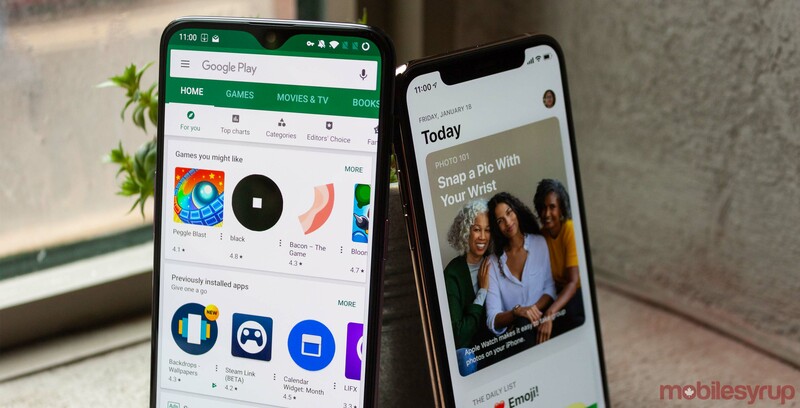 The Play Store saw significantly more growth despite lower revenue, going from $17.3 billion USD to $21.5 billion USD (approximately $22.9 billion to $28.8 billion CAD) — an increase of 24.2 percent. However, global game downloads grew modestly at 6.4 percent, to an estimated total of 38.3 billion across both stores. Apple made up 8.9 billion of those downloads, up 6.2 percent to 8.9 billion from 8.3 billion in 2017. The Play Store saw 6.4 percent growth, up to 29.4 billion from 27.7 billion. Overall, both Google and Apple have posted impressive growth numbers for their app platforms. However, it’s clear that growth is slowing down, if only a little bit. You can check out the full report from Sensor Tower here.